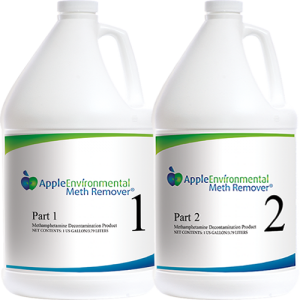 One kit of Apple Environmental Meth Remover® contains 8 gallons of product. At $389.00 per kit that equals $48 per gallon (which includes delivery within the continental United States – call for shipping prices to Alaska and Hawaii). Eight gallons treats up to 2000-2500 square feet depending on environmental conditions. Four one gallon jugs – Apple Environmental Meth Remover® Part 1, four one gallon jugs – Apple Environmental Meth Remover® Part 2 per kit. When mixed equally together Meth Remover is an 8 gallon mixture.